We thought we would take a look at IPv4 transfer volume at the mid-year point of 2018. We found that transfers continue to be significant across the three main regions, especially RIPE and ARIN. RIPE continues to have the highest number of IPv4 transfers, as shown in the chart below. ARIN has less than half of the number of RIPE IPv4 transfers and APNIC has about one-fifth of the number of transfers. How does this translate into the number of IPs transferred? In the first and second quarters of 2018 ARIN transferred the most IPs, moving 8.1 Million IPs in Q1 and 16.6 Million IPs in Q2. This is roughly equivalent to one and a half /8s over the course of 2018 to date. This IPv4 volume is down from the high in Q4 of 2017, but it is too early to say if the fourth quarter was the peak of the IPv4 Market. 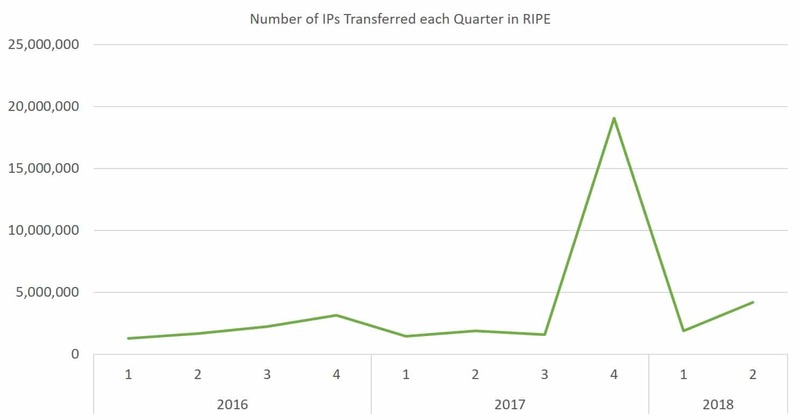 In RIPE we saw the number of IPs transferred also drop, but the number of transfers were higher. RIPE transfers tend to be more numerous but smaller. The number of IPs moved in RIPE was 1.9 Million in Q1 and 4.9 Million in Q2. This is less than one third of the IPs moved from ARIN region, which indicates that ARIN has more free IPs to transfer. 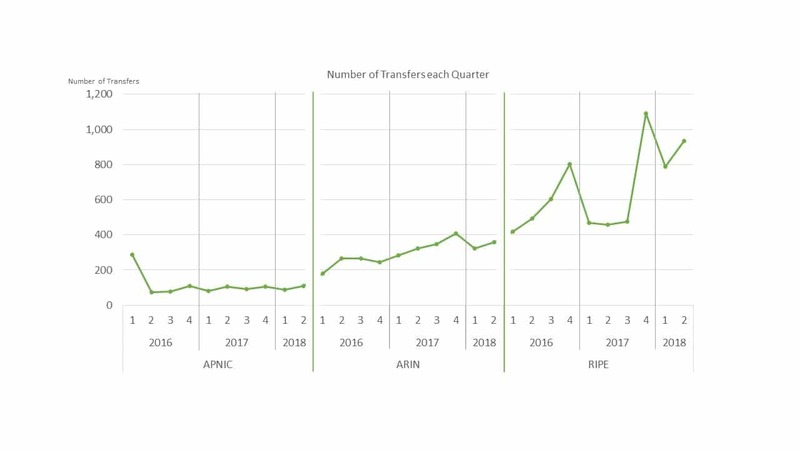 The number of transfers dropped in Q1 and Q2 and the number of IPs transferred also dropped, but it is too early to say the IPv4 Market peak has been reached. 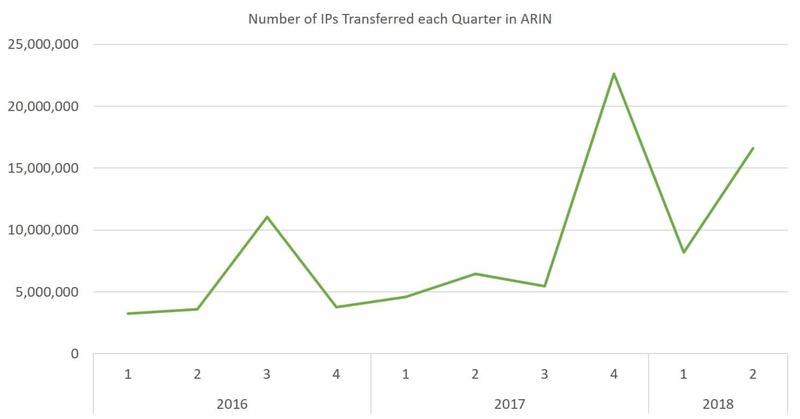 The number of transfers from RIPE are higher than ARIN, but the number of IPs are significantly less, which means the average transfer size in RIPE is much smaller. APNIC transfer volume trails both ARIN and RIPE. The IPv4 Market continues to roll along, and we will continue to watch the market as the transition to alternative technologies takes place. Stay tuned!